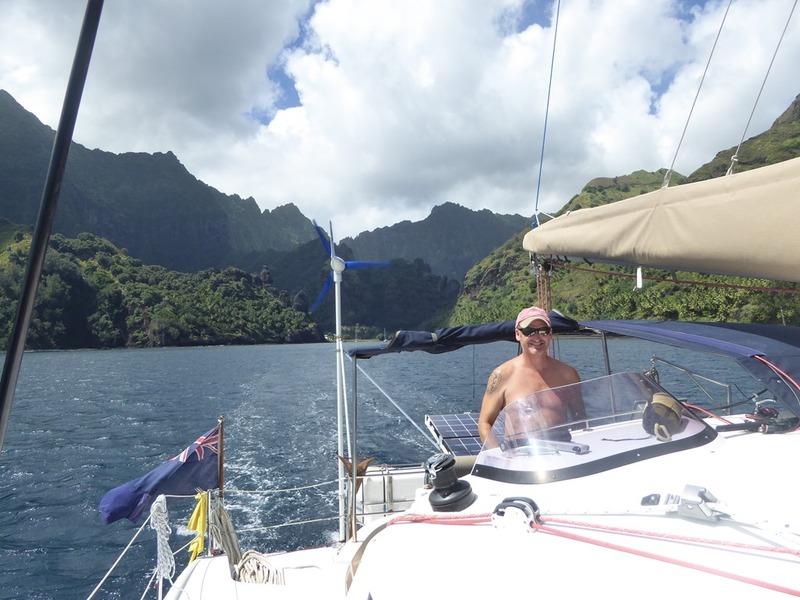 After the disappointing weather we had at Fatu Hiva the forecast was for a few days break then some heavy weather coming up from the S. If we didn’t move to the Tuamotus, we would be stuck at Fatu Hiva until the next break, which would be over 10 days away. As it is, the weather over the next few days should be perfect for a nice, easy reach all the way to Rarioa, 400miles away and our first atoll. With the wind forecast to drop considerably as we approach the atolls, we are aiming to arrive for before the high slack water at 1239hrs 29 Jul. Both are the product of many years of cruisers input and are extremely useful sources of information. The Compendium is probably better and has at least as good information as Charlies Charts and is easier to get around as well. The current guestimator is updated yearly so ensure you have the most up to date version available – if you don’t then it is useless. It is a god send when you are trying to work out when the current at the entrance passes to the atolls will be safest for transit. We packed up and had a lovely last morning with Dale and Tanja from Dragonsbane, an US boat who had just arrived. Professional sailors, now in semi retirement, they are circumnavigating. We had invited them across for coffee and they turned up with a blackberry sauce, a caramel dip, a sausage version of a fatata (wow) and the hard butter biscuits that the Marquesans love so much. We had a very pleasant breakfast talking about all the best anchorages for them to visit during their short stay in the Marquesas. 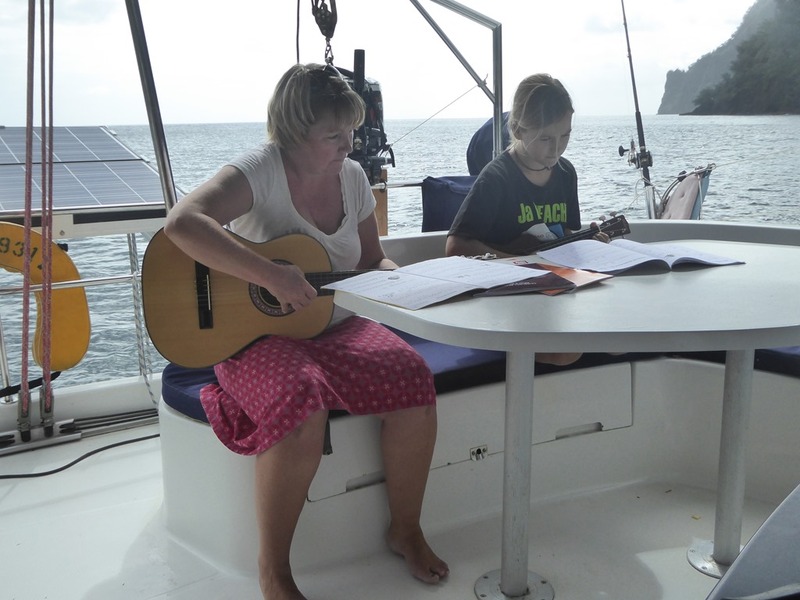 We swapped some cruising guides for copies of new ukulele music. On the basis that breakfast was far too good, we missed our chance to get to the post office but Dale and Tanja have kindly taken it upon themselves to post the cards for us. Lifted anchor at 1130hrs in sunlight!! Typical! 20+kts in funnel that is The Bay of Virgins then almost immediately no wind until we cleared the lee of the island then 15-20kts ENE with a 2.5m swell. 1 reef and full foresail. Occ squalls to 25kts. Dry and clear. Easy, comfortable and fast sailing. Wind has moderated overnight to 12-15kts ENE. Swell 2m with a long interval. Course 200T. Hardly a cloud in the sky. Going along comfortably at 5-6kts. It’s boring when it is as good as this! Spent the morning marking up the Marquesas Chart with all the anchorages we used and our route around the islands. The girls are reading. Hannah has just finished “ Confessions of a Murder Suspect”. Not sure how appropriate it was but she claims to have enjoyed it! When not practising her hand steering (saved the batteries an hour of autohelm this morning), Eleanor is getting stuck into the Anne of Green Gables series. The rest of the day has been uneventful. The wind has continued to drop and now sits between 8-11kts from the E. Boat speed is 4kts. An interesting night. When you reef, you let the main sheet out to take the pressure off the main. Unfortunately, someone had been practising their figure of 8 knots and hadn’t put it back in when they finished. Result? Sheet pulled through all along the boom to the mast and back out the pulley block at the end of the boom. Trying to fix that at 0230hrs in the pitch dark was trying! Eleanor woke to my swearing and helped, first by steering whilst I tried to rerig things and then as a boom weight to bring the boom down to a manageable height. She did very well. We practiced some steering by the stars after we were reorganised. She now knows the term “precession”! 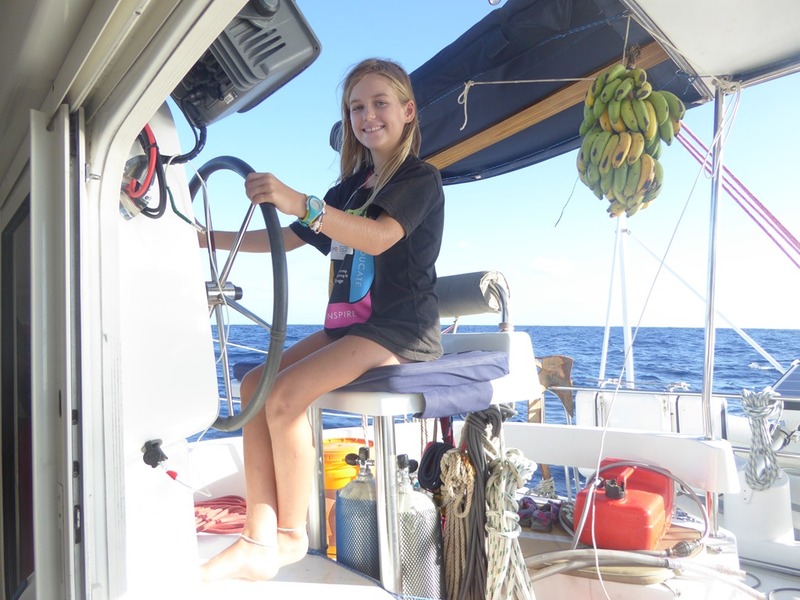 By the morning the seas were back up to 2m and wind had gone E to 16kts. By the evening, 10kts from the ENE and slowly decreasing. Slow going. We had a quiet day with both girls hand steering. We did have a strange companion for a while. It had the shape of a tuna but the tail and half the back was a purple colour, markedly different from the blue of the head. It travelled up by the bow for 20 mins and we watched it chase down small flying fish. With 140miles to go and no chance of making the cut tomorrow, we are going along at about the right pace. At this rate we will still have 6-12hrs to wait before we can think about trying the cut at Raroia. As the light died last night, so the wind eased to the point just after midnight there was less than 5kts. We bounced along doing a couple of knots, largely wave driven but by 0600, we had had enough of 2 miles per hour and started the stb engine. I fear this is the calm before the weather front coming up from the S reaches us. The only point of interest through the night was the large shark (we think) holding station just under the boat. It set the depth alarm off regularly, which was off putting to say the least. We often see schools of fish showing up at a single depth then quickly disappearing. This thing held station with us and we could watch it change depth. We tried searching for it with the big torch but saw nothing. It disappeared as soon as we started up the engine. We motor sailed with less than 8kts, the wind gradually getting more and more of a southerly component, right through the day . At last light, the wind arrived. 25kts and from the SSE! We haven’t seen a wind from there for a long time. It gave us a bouncy but fast sail. Thankfully the sea was slight due to the lack of wind the previous days and we managed to get into the lee of Raroia before anything got violent. We reached the cut just after midnight. With 8hrs to kill before slack water, we hove to. Catamarans aren’t great at this but we managed to hold our speed down to under 2knts and meandered back N up the island. At the top of the island where it started to get lumpy, we turned round, sailed back to the entrance and did the whole thing over again. At 0630 we moved towards the cut, dumped sails and got ready to try our entrance just before low water which was at 0806hrs. By 0745hrs, we were through, still against 2-2.5kts of current in the deeper water on the N side of the cut. But we had flat water and no standing waves. An easy entrance. Going in to an atoll, you should always try for decent visibility so you can see such dangers as reefs and bromies (huge lumps of coral that stick up 100’ from the bottom). 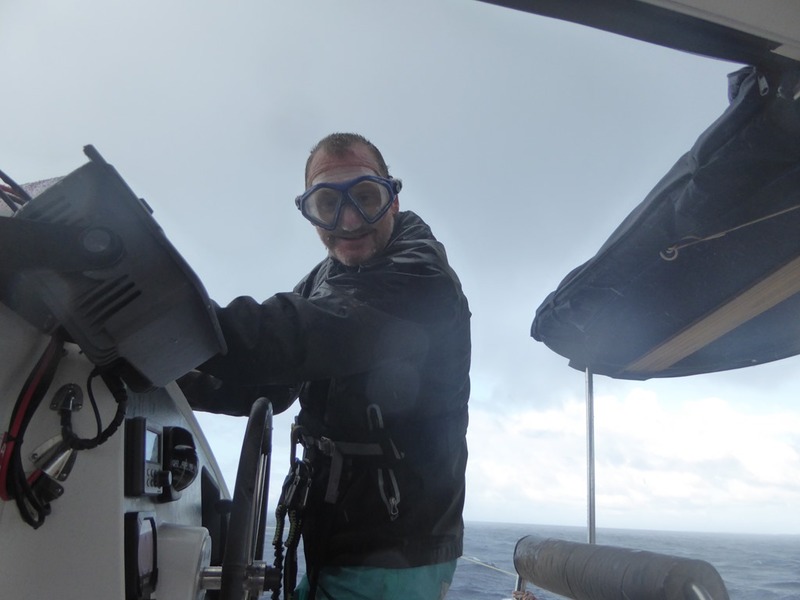 Sadly, the weather had other ideas and I was back to using a facemask, looking into the driving rain and 25+kts of wind. We just had to take it very slow (less than a knot steerage way) and wait for the weather to clear which, after an hour it did. I think that someone has taken a look at a google snapshot and overlaid the position of the obvious large bombies. Navionics seemed to be pretty accurate for the these although we spotted at least five smaller ones that definitely weren’t marked on the charts. Be warned! 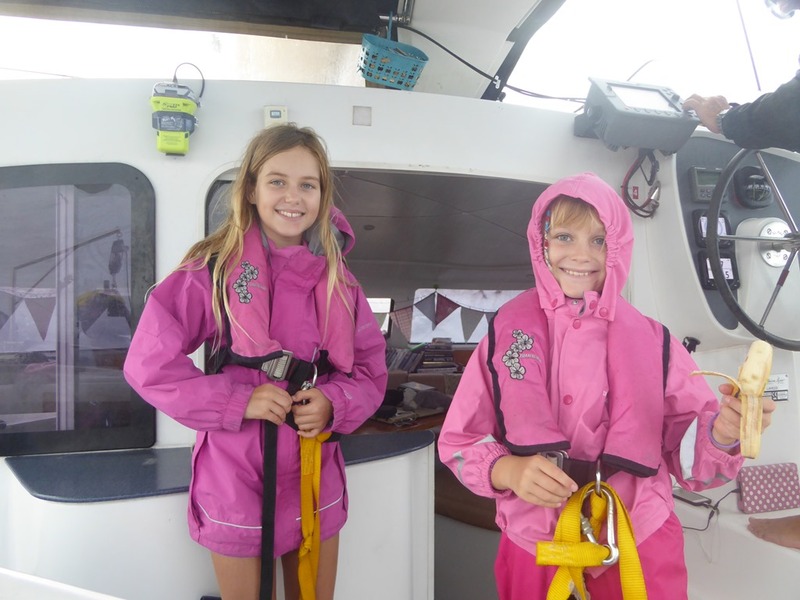 Even with the awful weather, the girls were a great help and suitably equipped with waterproofs, they stood at the front acting as extra sets of eyes. Having seen lots of jumping fish and birds (several types of terns and a few Frigate birds) feeding on them, we threw out the line and within 5mins we picked up this beauty. 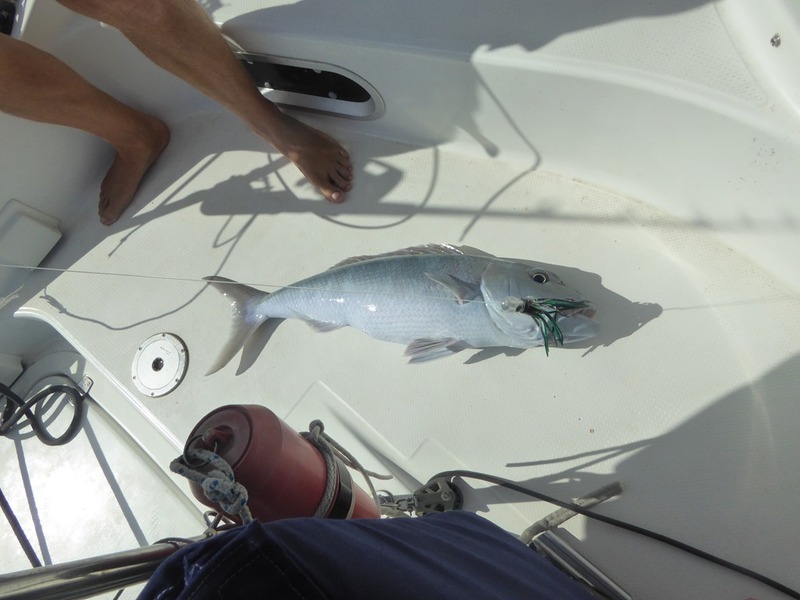 Not knowing what it was and unable to verify it with a local to be ciguatera free, we chucked it back. However, it bodes well for fishing here! The place is hoatching with life. Being a little exposed, we decided against the Kon Tiki anchorage and went another 2 miles S to a wonderfully sheltered beach, hiding behind high palm trees, about 1/2 miles S from the pearl farm. After a slow meander through the strings of pearl farm oyster lines, the sun finally came out. 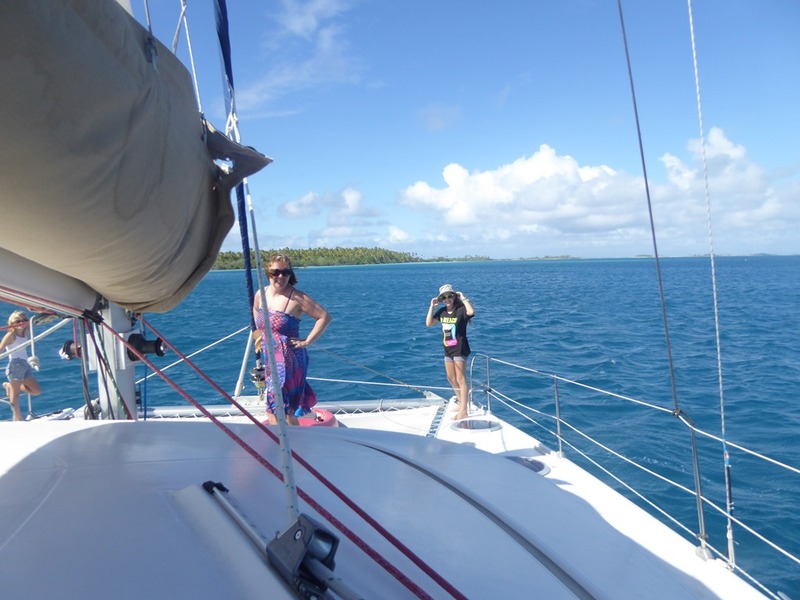 We anchored in 25’ of water, carefully trying to drop between two obvious coral lumps. It is a strange sensation as the boat is motionless as the sheltered water is absolutely flat. Water visibility is not great with water coming across the reef in huge waves which we can see breaking all the way down the island on the outside of the reef. Hopefully the weather will improve in a couple of days and things will get better. All in all, it was an easy passage with only the last 24hrs being a bit blowy. I’m sure we will have more interesting entrances to deal with but I am glad that for our first atoll, we got an easy in. Time to relax! With a view like this, I think we are going to enjoy ourselves. Great to see you all having a fab experience – something to remember for life. Keep safe. Teri, Penny and Gabriella.